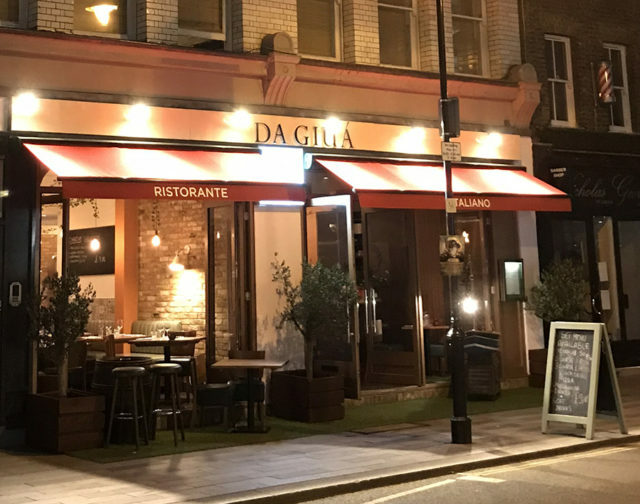 Da Giua is the new Italian restaurant you may have noticed which has just opened opposite Waitrose on Whitecross Street. There was a short-lived tapas bar (Sabor Iberico) before that and another fairly long established and well-regarded Italian (Alba) prior. 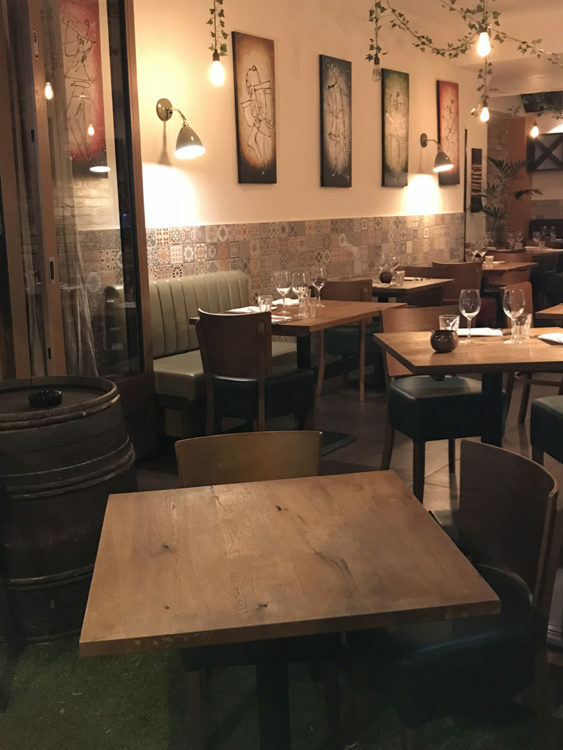 The short life for the tapas bar is a little worrying with respect to the location, but the new owners have the experience, for sure, with 2 other successful restaurants in London already established. The interior has undergone some refurbishment. 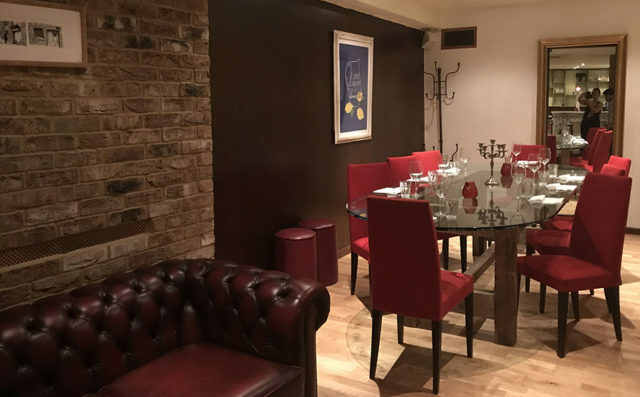 There is also plenty of spacious seating inside, with an additional bar and seating downstairs which can be used for functions for up to 60 people and for private dining. The facilities downstairs look great for a Christmas party venue in case you are on the search. 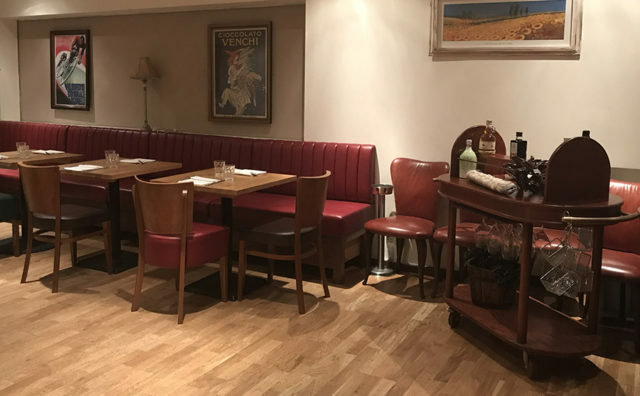 The atmosphere is comfortable formal downstairs with a more trattoria feel upstairs which has gloriously full opening windows onto Whitecross Street and some outside seating for warmer days. 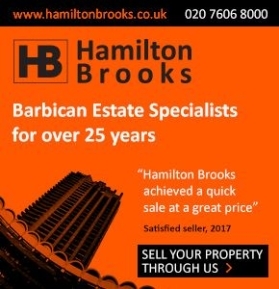 The staff are Italian and have brought the country’s charm with them; you can enjoy a genuinely warm reception and service from Umberto and his staff which is truly outstanding. A genteel lady came in just after we had been seated just for a coffee and it felt as if she had been a regular for years but the place had only been open for a few weeks by this point. The menu was not on the website at the time of writing this but I’m sure they will beef up their website (like those of their other restaurants) before too long. We were welcomed with a glass of prosecco, which was a lovely touch and they really didn’t have to. 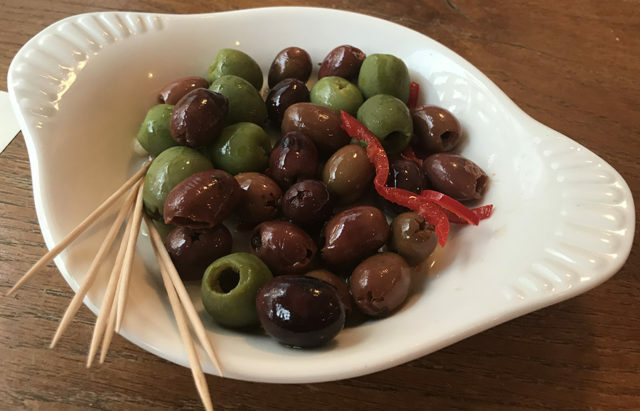 For nibbles, we had a large bowl of mixed pitted olives delivered with fresh bread and a generous bowl of dipping oil. I’m an olive freak so I battled not to eat them all, and the bread was very tasty and quite substantial; I thought it was polenta bread when I first snaffled a slice from the basket, so don’t go overboard on those carbs. Up next was a choice of drinks and, as expected, there is an all Italian wine list – not too pricey. Several wines were available by the glass and we chose perfectly acceptable glasses of dry white and full bodied red wines to wash down the meal at £6 apiece. For starters, we chose one of the Specials which was wrapped scallops on pea sauce. 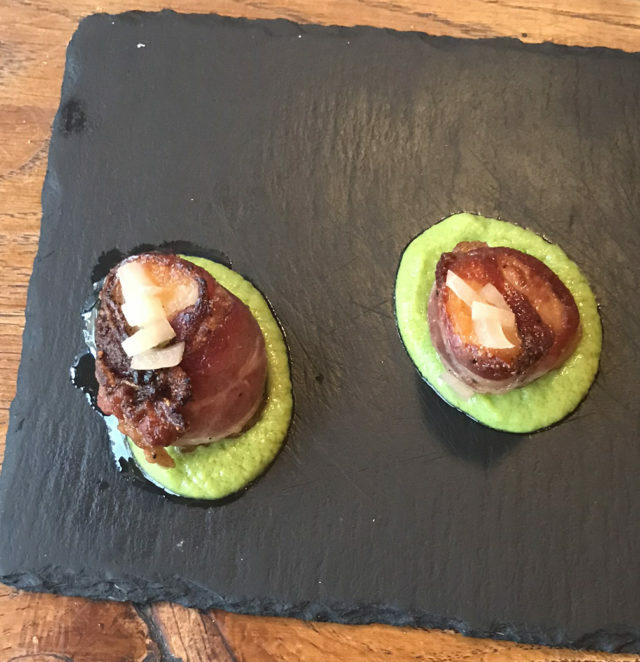 The huge scallops were cooked well and presented prettily on a large tile, wrapped up in a salty bacon slice which combined well with the bed of pea sauce. There were three scallops but the eyes were distracted by the presentation and we’d eagerly started before we remembered to snap a photo. Our other starter was the Fried Calamari from the menu. To be honest, I hadn’t expected a batter but it was delicate and all the more delicious because I’m currently cutting down on carbs. 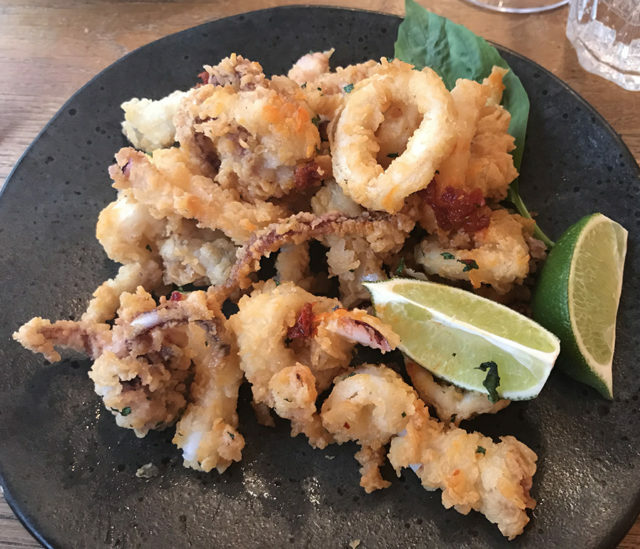 The calamari was a bit firmer than I would have expected (but I prefer it that way anyway, so I’m happy). To add some interest, tiny pieces of spicy nduja sausage punctuated the mild, slightly sweet flavour of the dish. For main, we chose two dishes from the menu although there were some very tempting Specials. 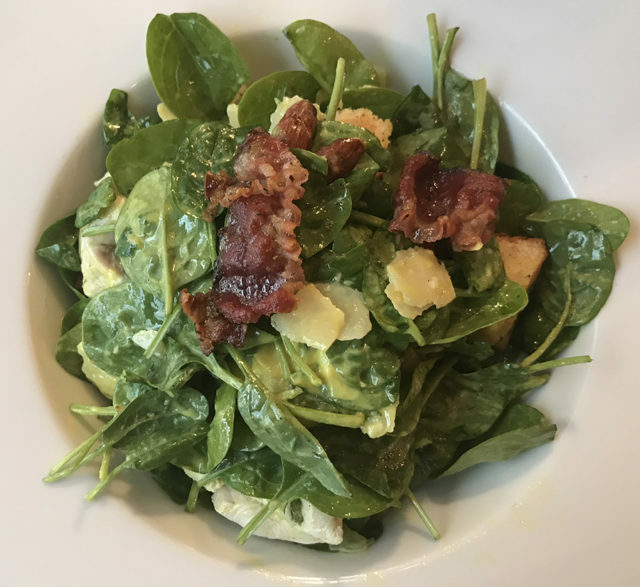 It was a hot day and a warm evening; the large folding windows were open and so I opted for a salad with baby spinach, chicken, grilled bread, parmesan, almond, mustard dressing and crispy pancetta. I loved this salad. I’m a bit bored with Caesar salad these days because I’ve had it so often, and this was a really appetising alternative. The greens were fresh, there was a generous amount of chicken and the mustard dressing and pancetta were mouth-watering. 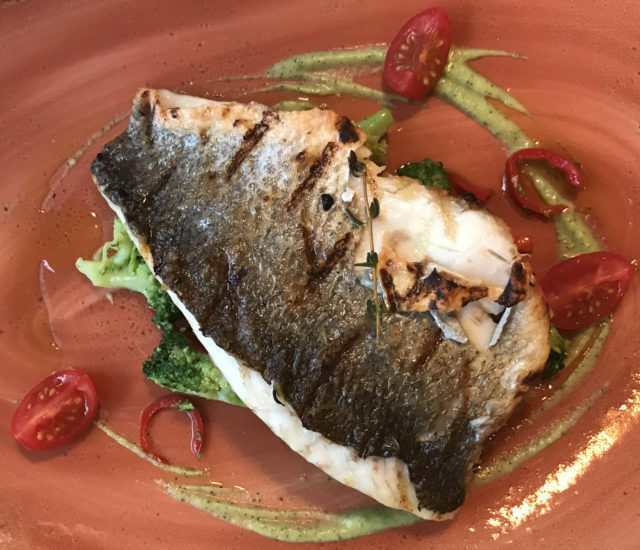 Our other main dish was Sea Bass. The fish was grilled well with a crispy skin which retained the succulent meaty texture of the large flakes. The dish came with (not overcooked) broccoli so no need for a separate side dish. For dessert, we chose the cheese selection and sorbet. The cheese plate came with biscuits and there was plenty for two to share. 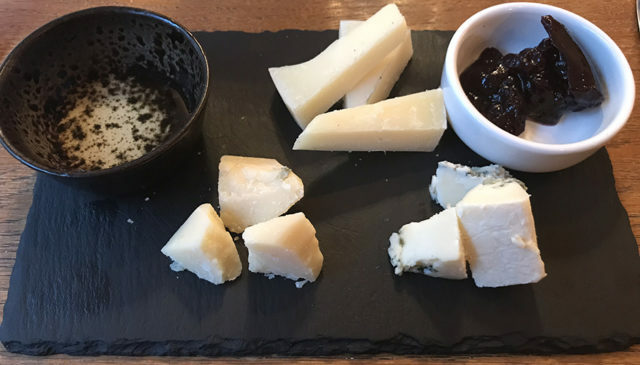 The sweet preserves balanced the cheeses and a new taste for me was the honey and truffle oil. 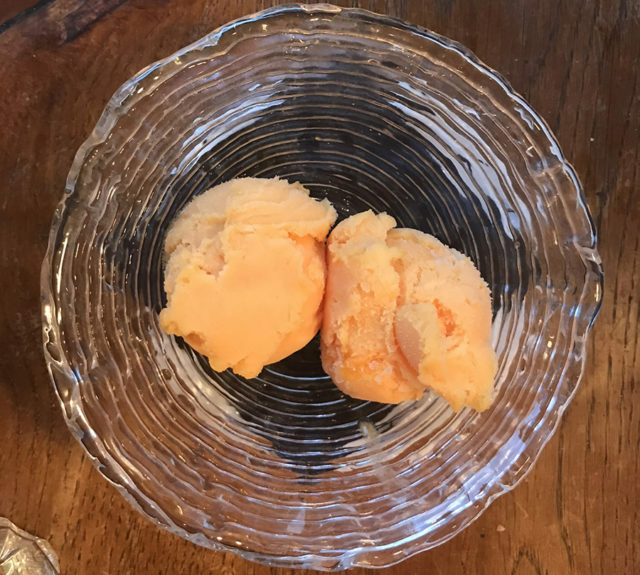 The refreshing sorbet was a fruity delight and you would expect nothing less. Desserts include: Tiramisu, ice creams, sorbets, Affogato (ice cream drowning in expresso), Sicilian Cannolo (tubes of pastry filled with desert and cream) and Chocolate fondant. Prices are all in the region of £5. Excellent coffee to finish (it’s worth a visit just for the coffee, in my opinion) and all done. This is a spacious and friendly family style restaurant with a firm trattoria vibe. Classic Italian dishes which you can eat in or take away (also on Deliveroo). The take-away pizzas seem to be pretty popular. The menu has a range of prices but I think they’ve got it about right, and the BA discount gives us 10% off as well. There is currently a bigger discount available if you book through Open Table, but the BA discount will continue after the Open Table one has ended. 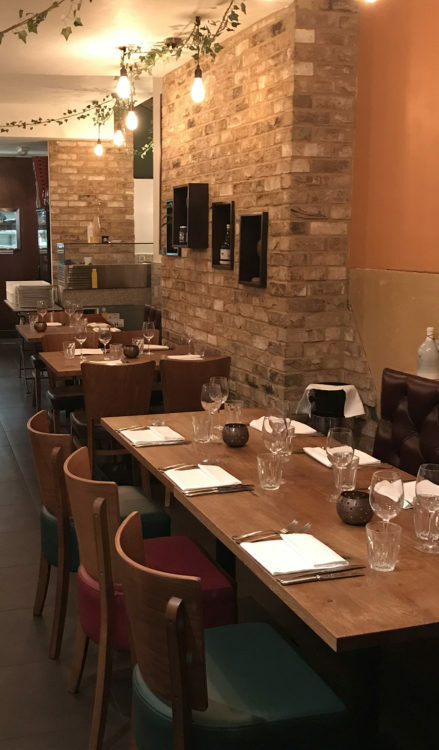 Da Giua is likely to be be a popular addition to the Whitecross Street restaurant scene.